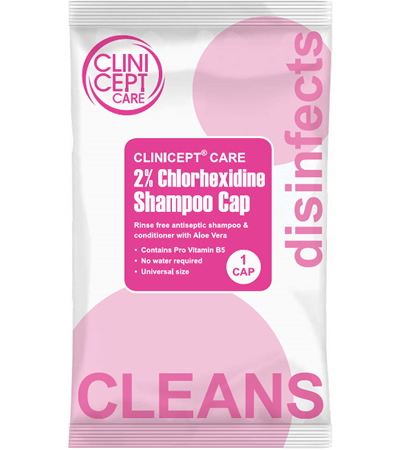 These antiseptic 2% Chlorhexidine Rinse Free Shampoo Caps have been specially developed by our highly experienced skin technologists to wash hair effectively with no need for water or rinsing. Clinicept® Care Rinse Free Shampoo caps contain an ingredient called Chlorhexidine Gluconate. This has a dual purpose action which not only kills harmful bacteria found on the hair and scalp but also binds to them, forming an invisible protective barrier. The antiseptic cap can be placed in the warmer (or microwave) before application, to aid patients’ comfort. All caps have a built-in conditioner. The shampoo caps are ideal for use in Hospitals, Nursing care homes, or for home use for the sick or elderly. We would like to hear about potential UK & International trade opportunities for Clinicept® 2% Chlorhexidine Shampoo Caps. If you are interested in distributing this product, please click here to contact us by email.